Researchers have designed a memory device based on atomically thin semiconductors and demonstrated that, in addition to exhibiting a good performance in general, the memory can also be fully erased with light, without any electrical assistance. The new memory has potential applications for system-on-panel technology, in which all of the components of an electronic device are integrated onto a display panel, resulting in ultrathin devices for automobiles, cell phones, and other applications. The researchers, Long-Fei He et al., at Fudan University and the Institute of Microelectronics at the Chinese Academy of Sciences, have published a paper on the new memory in a recent issue of Applied Physics Letters. As most existing memory technologies are too bulky to be integrated onto a display panel, researchers have been investigating entirely new designs and materials to fabricate ultrathin memory devices that still exhibit good performance. 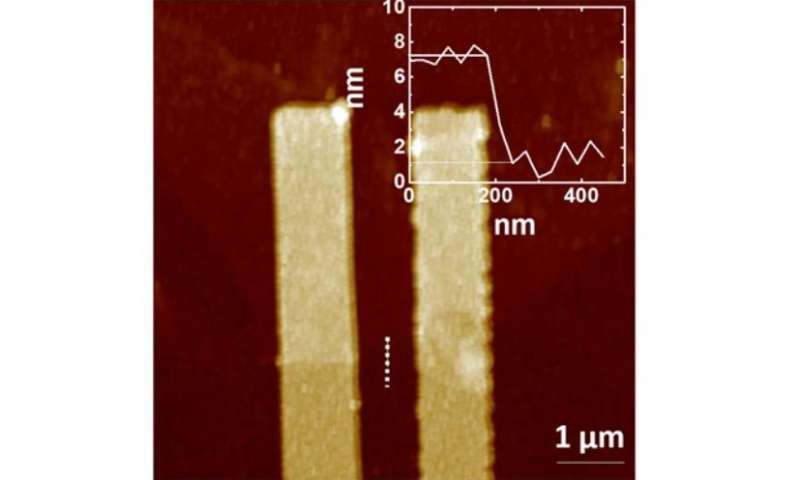 In the new study, the researchers used an atomically thin semiconductor—the two-dimensional transition metal dichalcogenide MoS2—whose conductivity can be finely tuned to allow it to form the basis of a memory with a high on/off current ratio. In tests, the researchers also demonstrated that the memory has a fast operation speed, a large memory window, and excellent retention: even under high temperatures of 85 °C (185 °F), the researchers estimate that after 10 years the memory would maintain 60% of its original memory window, which is still large enough for practical applications. Since previous research has demonstrated that MoS2 is photoresponsive, meaning some of its properties can be controlled with light, the scientists here investigated what happens to the overall memory device when illuminated by light. They observed that, when light is illuminated on a programmed memory device, the memory is completely erased. However, a voltage must be used to write to the memory, and a voltage can still be used instead of light to erase the memory. The researchers expect that, in the future, the new memory design may play an important role in system-on-panel applications, which they plan to investigate further. "In general, system-on-panel (SOP) describes a new display technology in which both active and passive components are integrated in one panel package, typically on the same glass substrate (sometimes system-on-panel is also named system-on-glass)," coauthor Hao Zhu at Fudan University told Phys.org. "This is different from traditional display technologies such as cathode ray tube (CRT) displays. One major characteristic of SOP is the application of thin-film technology, such as low-temperature poly-silicon (LTPS) thin-film transistor (TFT) arrays on the glass substrate. However, silicon-based thin-film transistors are being replaced by TFTs with new materials with improved properties. The indium gallium zinc oxide (IGZO) or zinc tin oxide (ZTO) thin film mentioned in our paper is also a good example. "Currently, we are working on the large-scale integration of such light-erasable 2-D memory devices using programmable light pulses with controllable wavelength and pulse duration," he said. "We are using new material synthesis methods such as atomic layer deposition to grow large-area MoS2 and other 2-D ultra-thin films for circuit-level applications." The second law of thermodynamics -- What does "from cold to hot" mean?